According to a survey done by RetailMeNot, 25% of people have at least one restaurant app on their phone. The smartphone age has made it easy for diners to check out a menu, read reviews, and make reservations before even leaving their home or office, and most diners would agree that having a variety of options for to-go and delivery orders on any of their devices isn’t so bad either. Smartphone apps have single-handedly changed the way that customers choose where to dine, when to dine and how to dine. Just a few years ago, many of these apps would have been considered innovative. These days, the integration of restaurant apps on smartphones is almost a requirement for restaurants in an ever-changing industry. So, what are the reasons restaurants should take the smartphone customer seriously? What do diners expect from restaurants in the smartphone age? Learning to adapt to the wants and needs of the digital diner is more important than ever. With information readily available to smartphone users at the tap of a fingertip, there is endless competition. On average, 50% of diners use their smartphone apps to search out a restaurant and its menu. More than 50% of smartphone users make reservations with apps, whereas only 25% still use their phone. This is especially true with consumers under the age of 34. Now, more than ever, there is a need to be accessible. A restaurant can have perfect service and amazing food, but without exposure, it’s only half-way there. For most restaurants, giving a customer, a positive experience isn’t the hard part, it’s getting the customers in the door. For customers who choose pick-up or delivery and those who prefer to use their smartphone for online ordering, the need for convenience is essential. The fast-food industry, for instance, has created a competitive market, using convenience to drive-in customers. Several brands are utilizing their apps not just to display menus or coupons, but for ordering. According to research from ComScore, the top five food and dining apps were largely composed of restaurants that offer customers the option of skipping the line by placing their order, paying and picking up from the counter when it is ready. Brands like Dunkin Donuts, Papa John’s and Starbucks now bring in around 30-50% of their sales digitally, and most of those digital orders come from smartphones. Most customers using apps like this are on the go and want a seamless experience. It’s not just restaurant-based apps that are integral to smartphone users. Facebook has served as a place for diners to connect with many restaurants if they have a Facebook business page. Facebook business pages allow users to “check-in” to alert their friends and followers when they are at the location. Encouraging diners to use their phone while they are in the restaurant is a win for everyone. 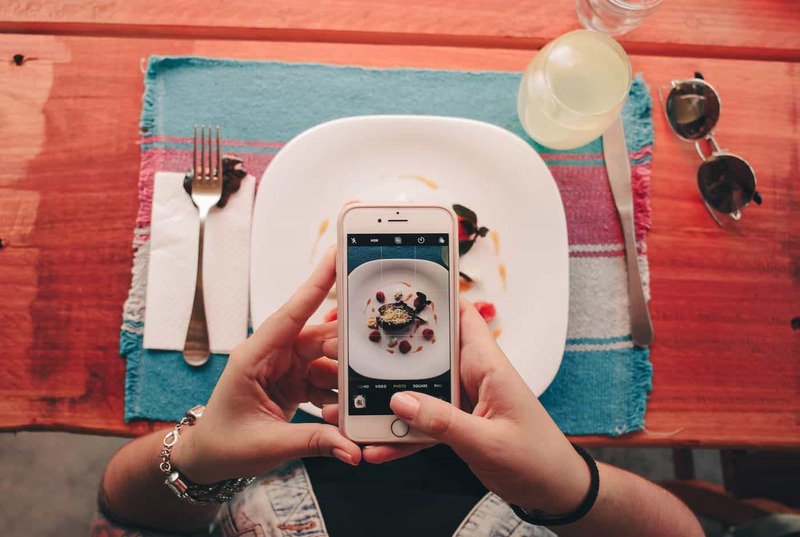 For other diners, posting photographs on Instagram and Snapchat lets them share their experience with their social circle. Restaurants are jumping on board by putting out dishes that will make favorable social media posts. Other restaurants utilize Twitter and Snapchat to interact with the guest in real-time. According to Google Consumer Surveys, 80% of diners are willing to try a new restaurant if it’s offering a deal. Promotions and discounts are a huge benefit to diners. Diners want a delicious meal, good service, and a good value. For many diners, mobile apps used for loyalty points and rewards have become a reason to return to a restaurant, especially if there is an incentive to come back for access to better deals. Diners like to feel appreciated, and in many cases, a little thank you here and there can go a long way. For years, restaurants have offered an in-house delivery driver. As the digital wave took over, there are now third-party companies in the market, offering more restaurants the ability to utilize the extra money from delivery, without adding the cost employing a driver. Apps like Uber Eats, Postmates, Seamless, etc. have taken this one step further. By having a driver or bike messenger go to the restaurant and place an order in person, a diner can hire someone to pick up food from restaurants that normally wouldn’t be available. Doughnut shops that have long lines, takeout from a Michelin-starred brunch and even late-night Taco Bell drive-thru are now available to diners thanks to the use of Smartphone apps. As diners are using their smartphones more and more to help navigate their dining choices, it’s important for restaurants to reach out to them via mobile marketing. The modern digital diner expects it. At the end of the day, diners depend on their smartphones to give them an edge. When done well, catering to diners who use their smartphones will drive more diners through their doors and keep their customers coming back for more.